“A REPUBLIC is little better than a government of devils!” So declared John Joachim Zubly, a man on whom our country had relied, and whom the Revolutionists had trusted. He was a patriot who suddenly turned traitor at a time when America and liberty needed every true man’s aid. But soon he and all the rest of the patriots realized that the time for half-way measures had passed. There must be either dumb submission or open defiance. And, should they choose defiance, they must free the colonies wholly from the British yoke and declare our country free and independent. It was to discuss this that the continental congress met at Philadelphia in 1776. We are apt to think that congress was a collection of ardent patriots, panting for liberty at any price. This was not wholly true. While the majority of the delegates were firm in their resolve to declare for independence, several of them threatened to balk at so rash a step. But, to their eternal credit, these wary delegates at last yielded to the popular voice. The Declaration of Independence was drawn up, and on July 4, 1776, was adopted (although it was not signed until the next month). The grave step was taken. The congressmen stood committed. They had “crossed the Rubicon” and were ready to take the consequences. There was one exception to this band of patriots. He was John Joachim Zubly, a Swiss, who had emigrated to America in early life and had settled in Georgia. Zubly was not only prominent as a scholar and a statesman, but was a preacher as well. He had shown great indignation at the colonists’ wrongs and had both written and spoken in protest against tyranny. So patriotic was he that Georgia chose him as one of its five delegates to congress in 1775. There he worked hard for the people’s cause and even drew up a petition to King George III, “upon the present unhappy situation of affairs.” Altogether, he was looked upon as an ardent patriot. Indeed, it is hard to understand the sudden and terrible change in the man. As soon as Zubly found congress was determined to adopt the Declaration, he fought the proposition most bitterly and utterly refused any part in it. He denounced the idea of a republic and did everything in his power to stem the tide of opinion. Had this been all he did no great shame need to have been attached to him. But he was not content with refusing to vote for the Declaration. He actually entered into secret correspondence with the enemy, betraying to the British the patriots’ private plans and giving warning that the Declaration was about to be adopted. What further harm he might have done the cause of liberty cannot be guessed, for a fellow congressman (Samuel Chase of Maryland) found reason to suspect him. A treasonable letter from Zubly was intercepted. Chase exposed the man’s whole black treachery to congress. Zubly fled in hot haste from Philadelphia to escape punishment. He went at once to Georgia. There, utterly casting away his cloak of patriotism, he sided openly with America’s foes. For this he was banished from Georgia and half of his property was declared forfeit. He rushed to the British for protection. After a few years of misery and disgrace he died, in 1781, while the Revolutionary war was still at its height. The colonial ball, which was given at the Kimball house last Friday evening, has developed the amusing fact that nearly everybody in Atlanta is provided with a great ancestor. To the strains of old colonial music, which might have soothed the ear of George Washington, when that distinguished patriot was a dashing cavalier, these ancestors in their knee breeches, powdered wigs and fluted shirts, marched out in gay procession before the assembled lookers-on. The customs in vogue before the revolution were revived in all of their quaint and amusing comedy and not a few of the old ancestors, as they skipped about the ballroom, gave refreshing evidence of the fact that age and long imprisonment in their respective places of abode had not impaired their ease of locomotion. In fact, their long retirement had seemingly lubricated their joints and prepared them, as it were, for greater exhibitions of agility. This ball will serve a beneficial purpose if it kindles a renewed interest in the old colonial era. It is a foolish idea which many have acquired, because of the rapid growth which has characterized this country during the present century, that our fathers were very simple men. There are many respects in which they far surpass us, and we could set at their feet, so to speak, and drink in many valuable lessons of social and political wisdom. After all, we only surpass them in the enlarged development of the inventive faculty, as applied to the practical aspect of life. We have steam engines, electric telegraph and sewing machines, all of which our fathers might have given us had they lived in an age of peace and tranquility, but they had no time for such thinking. From the science of war they emerged, without a moment’s rest, into the science of government, and began to study the problems that would shape the destiny of the new world and promote the happiness of their posterity. There is much to be gained from the study of past events, for wisdom lies in review as well as in progression, and the prophet’s vision is often clarified by looking backward. Americans have no reason to be ashamed of their simple and patriotic ancestry. A grander federation never met in solemn caucus than the continental congress of 1776, which proclaimed the principles of the American declaration and in the streets of Philadelphia kindled the flaming bonfires of liberty. 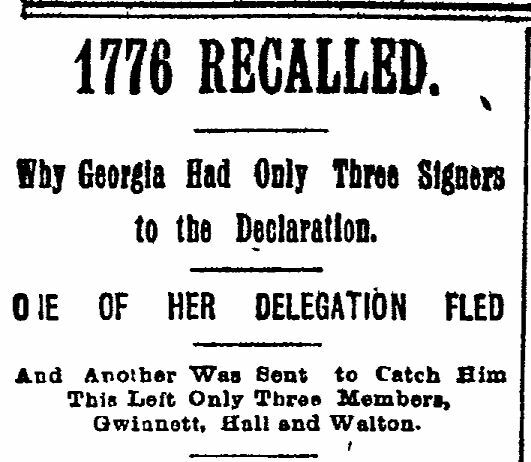 To widen the retrospective area thus opened by the social events of the week, it may be of interest to the readers of The Constitution to know that Georgia was entitled to five signers of the declaration. Instead of this number, however, only three names appear in her behalf on the scroll of independence. The other two have been omitted from the document, which is still preserved in Washington city. Behind the apparent oversight there hangs an interesting story and one with which only a very few, at this time, are familiar. The declaration of independence was signed by the members of the continental congress, which met in the spring of 1776. In this congress Georgia was represented by a delegation of five representatives. These were Button Gwinnett, Lyman Hall, George Walton, John Houston and Rev. John Zubly. The latter member, although a wearer of the sacred cloth, was guilty of an act of perfidy which has eternally blighted his reputation. During the early part of the session of congress a few of the members had privately discussed the subject of drawing up a declaration of independence, Zubly opposed the efforts of the delegation, on account of the strong political affinity which bound him to the English government. Although a member of the continental congress and Georgia’s accredited representative, he was not as ardent in his championship of liberty as the other members of the delegation. He was not in favor of any radical measure by which the colonies would be wholly separated from England. Finding, however, that his ardor was unavailing, he secretly dispatched a letter to the British governor, acquainting him with the nature of the situation and advising him to adopt, in Georgia, a speedy measure of prevention. A copy of this letter, by a fortunate accident, was obtained from one of the clerks, and Mr. Chase, a representative from Maryland, openly brought against Mr. Zubly the charge of improper conduct in betraying the interests of liberty. Seeing that his perfidy had been discovered and apprehending the action of congress, which he knew would blight his reputation, he cowardly betook himself to flight. Mr. Houston, a member of the Georgia delegation and a colleague of the clergyman, who had thus violated the sanctity of his high oath, was appointed by congress to go in search of him and to counteract any evil that might result from his disclosure of the situation. In addition to the search for Mr. Zubly, which occupied a considerable portion of his time, other important business detained Mr. Houston in Georgia for several weeks, and for that reason he was not present when the document of liberty was signed. There were only three of the Georgia members in their places, at this time, and these were Button Gwinnett, Lyman Hall and George Walton. The protest of Georgia, therefore, against the tyranny of England and her solemn declaration in favor of a total severance, was couched in the strong, manly and characteristic signatures of this illustrious trinity. In Augusta, Ga., a handsome granite monument has been erected to the signers, and three counties have been named for them, as a tribute to their exalted memory. A braver, bolder or more devoted trio never served the cause of liberty, and their glory, like Orion’s belt, illuminates the misty background of our colonial history. On the Field of Honor. The first of these signers, Mr. Gwinnett, was the unfortunate victim of the code of honor. His antagonist was Colonel Lackland McIntosh. A feud of long standing was the cause of their fatal meeting. The failure of Mr. Gwinnett, in 1777, to be re-elected to the continental congress, after a warm fight, exasperated him no little and the taunts of Colonel McIntosh, who was greatly pleased with the result, prompted him to send a challenge to that gentleman. The challenge was accepted. They agreed to fight with pistols at a distance of only twelve paces. In exhange of bullets both principals were wounded. Colonel McIntosh however, recovered, while Mr. Gwinnett was mortally wounded and died on the 7th of May, 1777, in the forty-fifth year of his age. 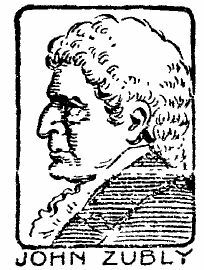 Mr. Gwinnett was an Englishman by birth and for several years was engaged in mercantile pursuits in Bristol. After his marriage he came to America, in 1770, and settled on St. Catherine’s island, near the coast of Georgia. At first Mr. Gwinnett was not an ardent friend of liberty, because of the exposure of his property. He doubted the ability of the colonial government to cope with England in a fight for independence. When he was afterwards convinced, however, that independence was a possibility, he entered into the revolutionary protest with great enthusiasm. His property was seized and totally destroyed by the British and yet he was loyal in affliction to the cause which he espoused. Dr. Lyman Hall was a devoted patriot from the beginning of the movement which resulted in the overthrow of English tyranny. The remaining signer, George Walton, was the most distinguished of this colonial group. He was six times a member of the continental congress, a soldier of the revolution, the first governor of the young commonwealth, the chief justice of the supreme court, and for nearly fifteen years prior to his death a stainless wearer of the judicial ermine. His home is yet standing near the city of Augusta, in plain view of the Carolina hills. Here he entertained Washington and LaFayette, during the days of the revolution, and dispensed his lavish hospitality. Colonel Walton was a man of great genius and his memory is the precious heritage of all Georgians. A subsequent article may touch upon his services at greater length. His grave is on the Sand Hills, near Augusta, Ga., where he has slept, under the overhanging foliage, since the first faint glimmering of the century. This entry was posted on October 13, 2011 at 8:52 am and is filed under Historic Blackguards, Lifestyles, Politics. You can follow any responses to this entry through the RSS 2.0 feed. You can leave a response, or trackback from your own site.